Wednesday is one of my favorite days of the week. It’s my day off from work and it’s a day I take time to do some things for myself! Me-time! I often spend a big part of my wednesday’s in the kitchen to make myself something special for lunch of dinner. Today I stopt at the Asian store in our street while I was on my way to the supermarket. Today my attention was caught by a box full of egg-sized, hairy tubers. I found out that they are called ‘Taro’ and they’re mostly cultivated in Asia and Africa but probably orginated from India. Not only the tubers, but also the big leaves of the plant are edible. 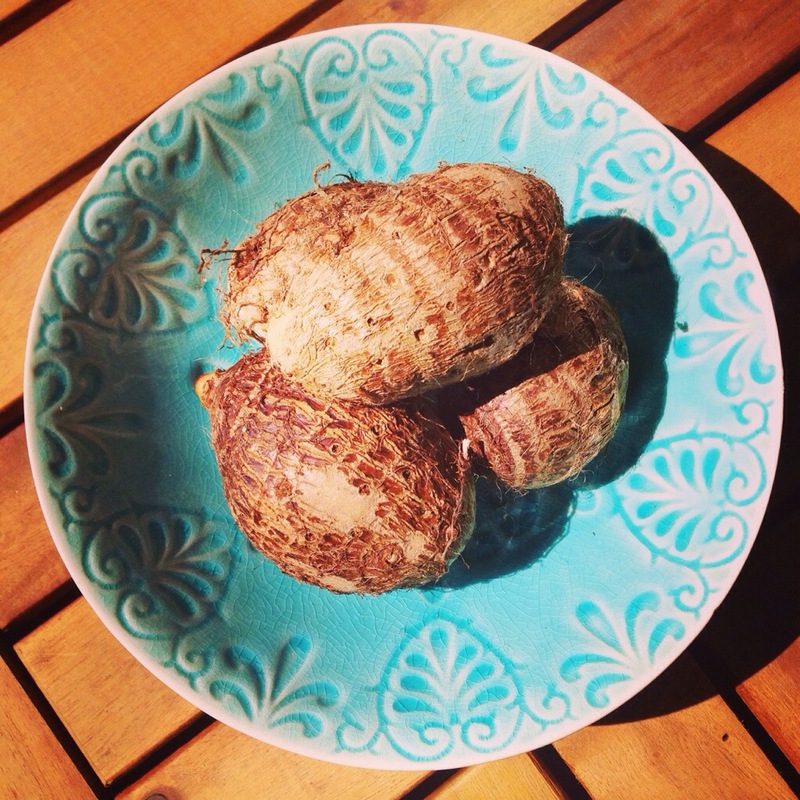 A little research tells us that Taro can be cooked, baked, roosted and fried. I decided to take home some of the Taro and turn them into a soup, since you can turn practically EVERYTHING into a soup! While working with the Taro I noticed they are a bit like potatoes. While peeling them I found out they are white on the inside and they’re a bit moist. I put they in a huge pot together with one leek and an onion because leek and onion always do well in a soup. I also added some vegetable stock. Because the Taro doesn’t have that much taste from itself (a light sweet and ‘creamy’ taste) I added a pinch of cayenne and made a Marjoram oil to drizzle on top. Braise the leek and onion in some oil for a few minutes. And the bits of Taro and the vegetable stock. Bring to boil and let it boil for about half an hour. 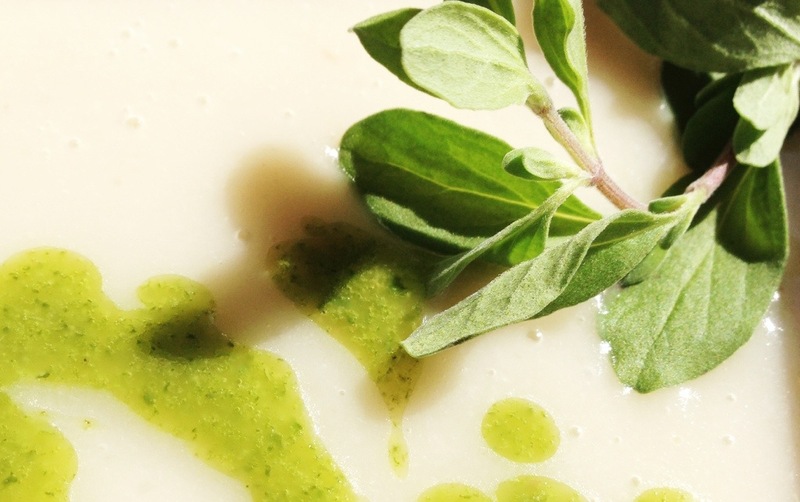 Puree the soup with a mixer or in a blender until really creamy and silky! Add salt, pepper and cayenne to taste. For the oil you putt all the ingredients in a blender of mixing cup and blitz it all up! Drizzle on top of the soup before serving. Posted in Diner, Lunch, recipes, SoupTagged comfortfood, recipe, soup, Taro, tuber, vegan, vegetable, vegetarian, veggieBookmark the permalink. nice! 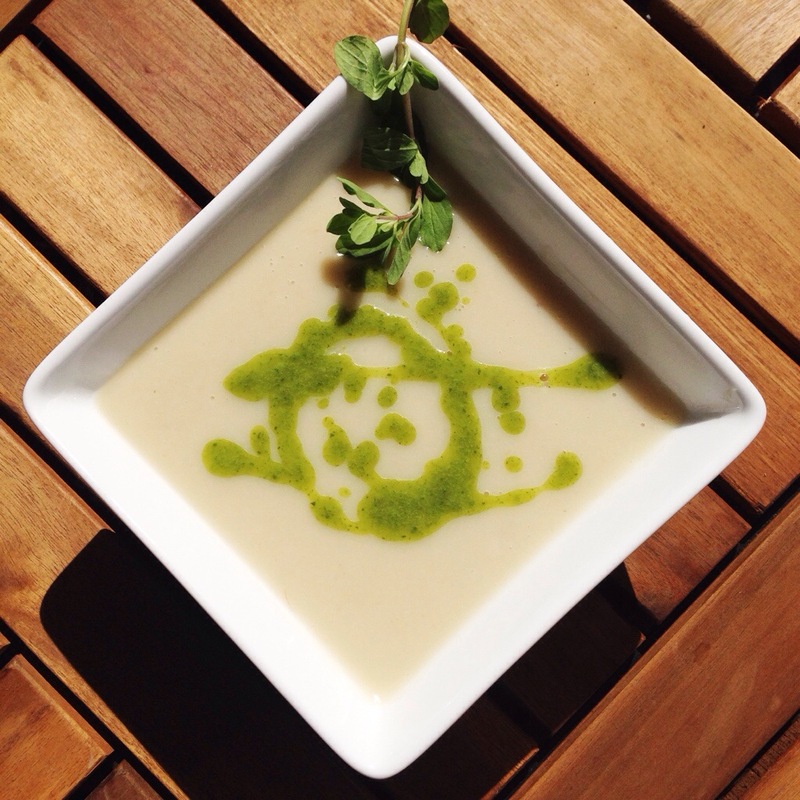 we love taro, but never imagined making soup out of it. definitely will try it out. Was het ook lekker? Stoer dat je zomaar iets onbekends meeneemt en op deze manier ontdekt!